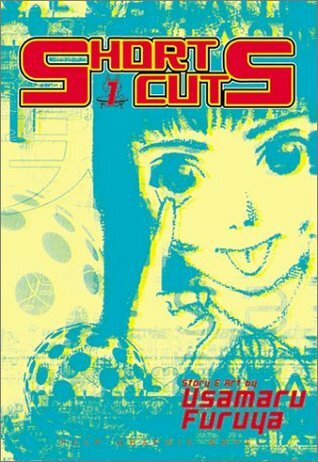 Short Cuts is, as described, short pieces in manga style, primarily focusing on the so-called "ko-gal"--Japanese teenage girls. Vapidity, fashion, shallowness from people of all walks of society, and sometimes straight-out bizarre stories pepper this hilarious volume of manga shorts. Not every joke makes sense to Western readers, but the extra notes can sometimes help those of us without in-depth understanding of the culture Furuya is satirizing here. It's laugh out loud funny even if you think it won't be, with internally contained jokes that don't have a specific plot. Oh, and they're usually kind of dirty. Read with caution. This is pretty funny stuff... This artist has a bit of a disturbing obsession with Japanese school girls (kogals) and they make up the main characters in this novel along with their arch-nemesis, the dirty businessmen (oyagi). It's called 'short cuts' because each comic is a short featurette only one or two pages. It's funny if not a little raunchy at times and makes for a great bathroom reader for those moments when you don't have a lot of time or brain power to devote. Well illustrated and wryly humored look at Japan's cultural obsession with ko-gals and other schoolgirls. Doesn't come across as preachy at all, which I appreciated, because my take on the "Japanese schoolgirl" phenomenon is basically the same as every other (honest) persons: namely, that such obsessions are rather odd, combined with more than an inkling of "but they sure are pretty." ode to jap ko gals... hilarious, irreverent n highly imaginative. Usamaru Furuya - See also 古屋 兎丸.